Üniversitede okuyan 25 kız öğrenci için burs projesi Antalya çağdaş eğitim ve kültür vakfı kızlarımızı destekleyerek, genç kızlarımızın gücünün topluma ve ekonomiye katılımını sağlıyor. Desteğiniz daha fazla kızımızın eğitim hayatına destek sağlayacak. Daha çok kızımız dayanışmayla toplum içinde var olacak, eğitimini tamamlayıp, ekonomik hayata katılacak. The Name of the Organization: ANTALYA ÇAĞDAŞ EĞİTİM VE KÜLTÜR VAKFI (ANTALYA CONTEMPORARY EDUCATION AND CULTURE FOUNDATION) Address of Our Organization: Milli Egemenlik Cad. Kent İşmerkezi No: 24C/43 07040 ANTALYA TURKEY Website of Our Organization: http://www.antcev.org Information about Our Organization: Antalya Contemporary Education and Culture Foundation (ANTÇEV) is a non governmental organization which was founded in 1995 by 228 members who are all volunteers. 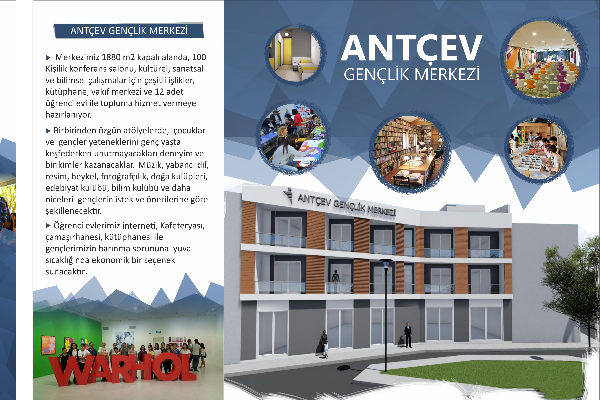 ORGANIZATION SCHEME: ANTÇEV Board of trustees Boarding Council (9 members) Professionals (1 director, 1 secretary, 1 accountant and 1 driver) Committees for each project Volunteers of ANTÇEV (All the Boarding Council members and Committee Members work voluntarily.) INCOME: Membership fees. Individual donations. Fund raising activities such as concerts, dinner parties etc. Garlands made by our foundations Organization of the educational services, such as teacher training, CIT and language courses. AIM: To work on the projects mainly focused on the education of children, young people, teachers, parents and adults for the goal of secular and democratic Turkey. GOALS: To focus on modern education, To organize activities and to realize projects in order to make educational system in Turkey secular, scientific, rational and democratic. To build schools, dormitories, social centers, youth centers, and support those which have already been built for any level of the general education. To organize scientific, cultural and sport activities. ACTIVITIES: Organizing intercultural exchange projects for young people and trainers with EU member countries, ( i.e. exchange of vocational education students to prepare them for the competition in international market) Providing successful but economically insufficient university students scholarships. Helping economically insufficient children to continue their education and to organize courses, seminars or summer schools to contribute their self development. Taking part in EU (Socrates, Youth, Leonardo da Vinci, etc.) and World Bank projects Organizing seminars for teachers/ educators and parents. Organizing conferences, panel discussions or seminars on education. Organizing social, cultural, educational and sports activities, festivals, fairs. Main Objectives and Tasks in the Project: In this project ANTÇEV will carry out courses and seminars for unemployed people from disadvantaged areas to improve their computer and internet using skills and to help to improve their ability to find a job by teaching them to evaluate themselves more correctly according to the business needs, besides to increase their employment level with the great experience gained from EU-Active Employment-New Opportunities Program. 45 to 60 learners expected to participate in the project. MANİSA CELAL BAYAR ÜNİVERSİTESİNDE OKUYOR OLAN YAKIN BİR ARKADAŞIM VAR AİLEVİ DURUMLARI ÇOK KÖTÜ ELİMDEN GELDİĞİNCE BENDE YARDIM VE MADDİ YARDIMDA BULUNUYORUM FAKAT HASTA BİR KARDEŞİ VAR KENDİSİDE ÇEKİNGEN VE ÇOK TEMİZ BİRİSİ ARKADAŞIMIZ PART TİME ÇALIŞMASINA VE GURBETTE OLMASINA RAGMEN AİLESİNE DESTEK OLMAYA ÇALIŞIYOR SİZDEN RİCAM BELLİ ETMEDEN MAHÇUP ETMEDEN ONA DESTEK OLMAK İSTİYORUM HESAP VE İBAN NUMARASINI ALDIM SİZLERDE BİR EL UZATABİLİR MİSİNİZ?